Quite a bit of history in this picture. Arthur Chevrolet is seen at the inaugural race for the newly opened Atlanta Speedway in a Buick race car. Arthur Chevrolet was a brother to Louis Chevrolet, the famed co-founder of Chevrolet. 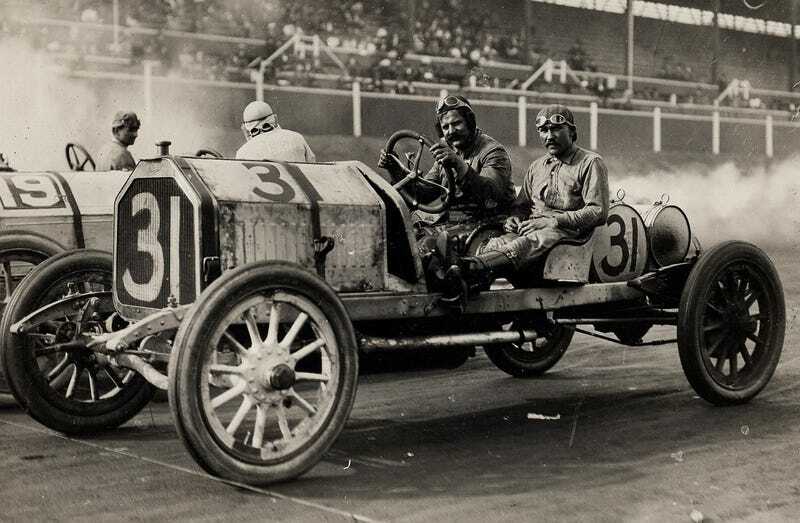 Louis and Arthur both raced for Buick early in their careers. Arthur Chevrolet held the first patent (1930) for an overhead valve engine and a device that was used to retrofit an overhead valve train assembly to existing flathead engines. Louis Chevrolet partnered with William C. Durant and others to start Chevrolet in 1911. Durant was previously hired by David Dunbar Buick in 1904 to manage his new car company Buick. Two years prior to hiring the man that would take his company from him and create General Motors, Buick invented the overhead valve engine.